Filed to: who framed roger rabbit?Filed to: who framed roger rabbit? While Who Framed Roger Rabbit? is packed with cartoon characters from various studios, a handful of Toons didn't make the cut. 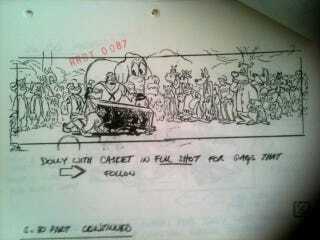 Popeye, Bluto, and others appear only in this storyboarded funeral scene. An early script for the movie include a scene in which Eddie Valiant attends Marvin Acme's funeral. The storyboards recently popped up on eBay, giving us a look at the characters who could have been highlighted during the funeral. The movie's producers didn't end up getting permission to use the characters from Popeye or Tom and Jerry in the final film, so they appear only here in the storyboards as pallbearers. (Michael F. notes the mouse is probably not Jerry but Herman the Mouse, which would explain the pants and shoes.) This also would have been Felix the Cat's only animated appearance in the film, although he appears at one point in a photograph in the background. There are also a number of other cartoon characters lurking in the background, including Tom the Cat, Horace Horsecollar and Clarabelle Cow, Tex Avery's wolf, and a host of others. Every famous and obscure Toon turns out for Acme's funeral, with Foghorn Leghorn delivering the eulogy. You can also see a fuller analysis of the scene at Jim Hill Media.